Although the late use of the Valentines Day postmark might have made it into the April listings, the first one we have is 'Happy Easter'. It's an odd phrase, given the background to the religious story, but so few people actually practice their religion these days that secular considerations of eggs, rabbits and cards seem to have taken over - I couldn't even find a religious postcard for my previous greeting (see below). Thanks to MG for sending this from Glasgow MC. I understand that the other machines have the slogan in three lines. 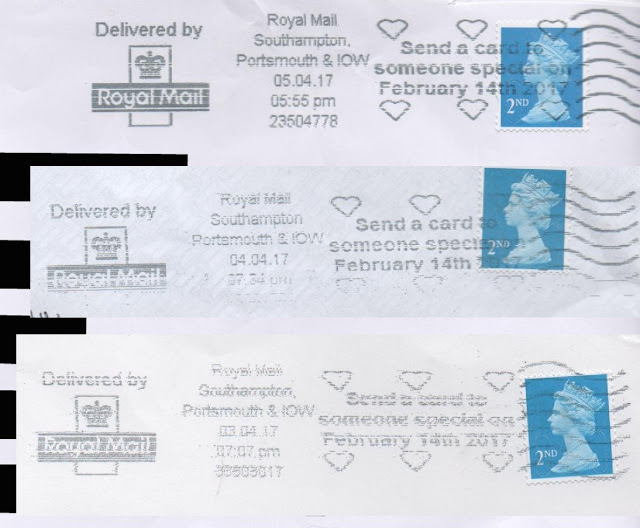 I wonder if Royal Mail will take up the suggestion to have a slogan for National Stamp Day/Week? One can only hope! But then they switched to Easter - I wonder what will come when that campaign finishes? Edinburgh Mail Centre was also using Happy Easter on 18 April but the copy I have is on a Post and Go stamp (one not from a collector!) and so doesn't really scan well. It's National Stationery Week and so there is a new slogan to encourage people to write! This one from North and West Yorkshire on 25 April 2017. ... and to JG for this one from Manchester MC on 25.04.17 which includes the 'Delivered by' portion omitted from the first one shown. Thew religious background to Easter is happy really, Jesus rose on the third day after all. All is well that ends well. A pity there are not yet stamps to commemorate it. Chicks daffodils and such like would make good subjects.